Show and Tell Meg: Swagbuck Extravaganza Today - 60 Swagbucks! Swagbuck Extravaganza Today - 60 Swagbucks! Swagbucks is having a Swagbuck Extravaganza today! They are giving out codes for Swagbucks all day on their blog, facebook page, twitter page, widget, and toolbar. There will be 12 codes from 10am to 4:30 pm. Also, you need to pay attention to what the code says as each will reveal a letter. At the end of the day (4:30pm) you will need to unscramble the letters to spell out a word and it will give you an additional code! One code will be worth 20 points sometime today, so keep checking. 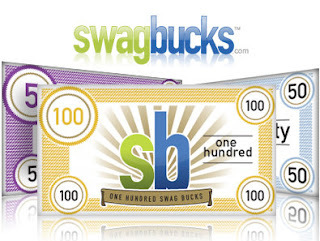 Also, if you are not a member of Swagbucks yet, you can sign up here to get 30 swagbucks!